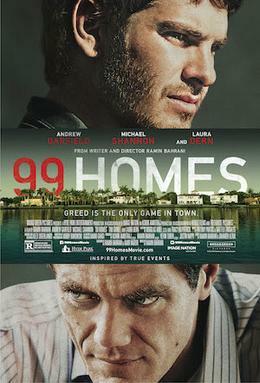 The following is a quick review of 99 Homes, a Ramin Bahrani film. Ramin Bahrani’s 99 Homes follows Dennis Nash (played by Andrew Garfield), a construction worker, who is supporting his mother (played by Laura Dern) and his own son. But soon after Dennis loses his job, he and his family are evicted from their home. Rick Carver (played by Michael Shannon), a real estate operator, oversees the eviction, and one of his men end up taking a tool from Dennis’ house. When Dennis returns to retrieve it, Rick offers him a job, and soon Dennis, himself, starts to carry out evictions. 99 Homes is definitely a drama, but at times it is downright terrifying. Seeing families being evicted is really scary and uncomfortable. Later, when the tables are turned, it is absolutely heartbreaking to see Dennis doing Rick’s dirty work. It becomes really tough to empathize with Dennis at one point, and the major reason why these scenes work as well as they do is because we’re treated to some excellent performances. Laura Dern, who plays Dennis’ mother, is solid in this film, and Andrew Garfield is great as Dennis. If Garfield keeps on giving performances like the one that he gives in 99 Homes, then his (to some) somewhat underwhelming time as Spider-Man will be nothing more than a footnote in an otherwise terrific career for a leading man. And then you have Michael Shannon who is absolutely magnificent here. Shannon’s Rick is self-assured and so incredibly unlikable. It is one of Shannon’s best performances ever. 99 Homes is far from perfect. I loved, maybe, eighty percent of the film, but in the last 25 minutes, or so, the film started to disappoint. The film’s last act is really predictable, and the ending isn’t very good. That said, 99 Homes is a really good drama with outstanding performances and some very intense scenes that will have an impact on you.